Description: This nature set featuring a yellow case with 9 built-in compartments with hinged clear windows for storing bugs, rocks, leaves or other things gathered with the accessory catching net. The set includes a descriptive nature book to teach children how to explore and examine items that they find in nature. Designed for children ages 5 years and older. FPT44997 - Yellow rectangular carrying case with a handle on top, and 9 compartments to store items into. Each compartment has a hinged clear plastic window to allow children to see everything that they have collected. The handle is marked, "Fisher-Price" and is squared (open top and sides) to provide storage for the catching net. 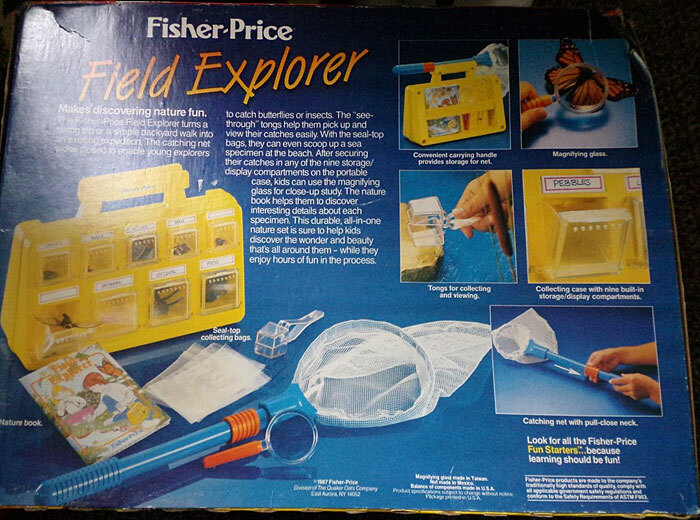 The case is marked "Field Explorer" on the front bottom right corner. The back of the carry case has a storage bar to store the accessories listed below. FPT44998 - Clear plastic (transparent) insect tongs with a squared box on the end to catch insects. Squeeze the tongs near the neck to open the squared box to catch insects. FPT44999 - Magnifying glass with a red handle. FPT45000 - Catching net with a blue handle and an orange pull-close neck to catch flying insects. 3 each - FPT45001 - Small clear plastic zip lock bags. 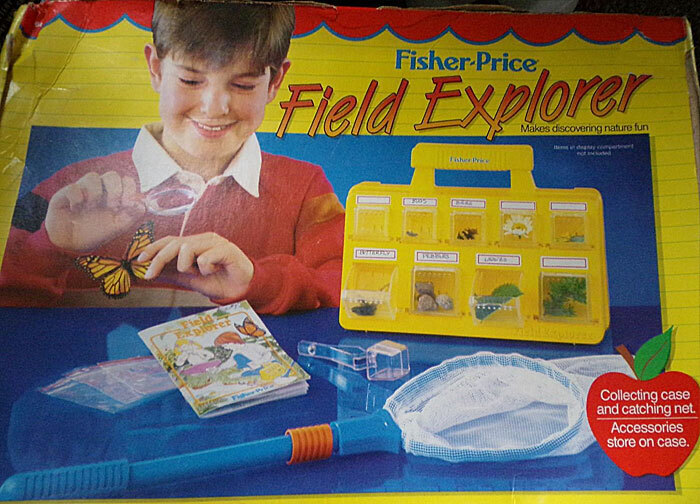 FPT45002 - Nature book marked "Field Explorer". This set was sold in a 16" long, 12" high, 4-5/8" deep box.